The caterpillars pupate in their twig, anchoring it to a branch or other convenient item. 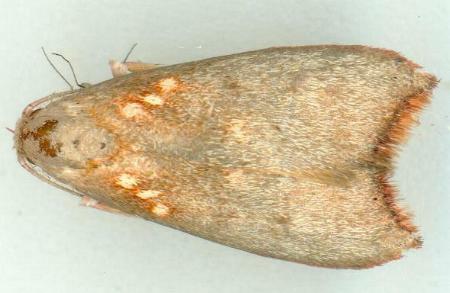 The adult moths have brown forewings each with three pale spots near the base, and an orange fringe of hairs along the margin. The hindwings are pale yellow with dark veins, and darkening toward the margins. The forewings each have a recurved wingtip, and the hindwings each have a pointed wingtip with hardly any corner at the tornus. The wingspan is about 2 cms. CSIRO Publishing, Melbourne 1994, pp. 323-329. Volume 9, Number 4 (1885), pp. 1068-1069.